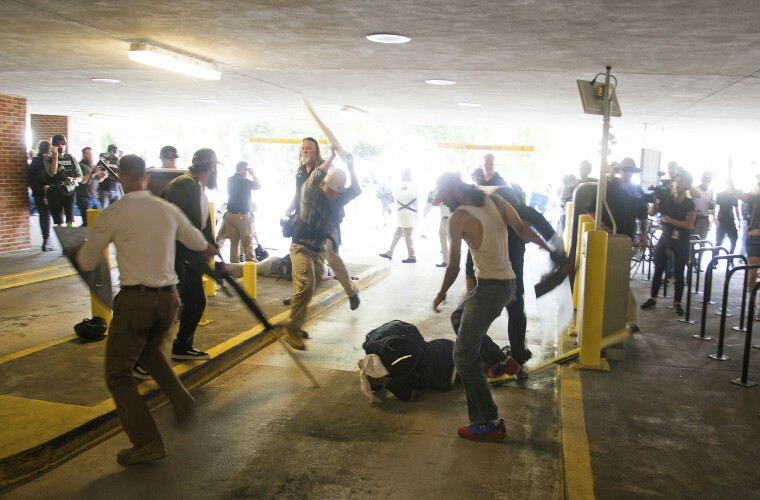 DeAndre Harris, the black man whose beating by a group of white men in Charlottesville, Virginia, in August sparked a virtual manhunt for his attackers, was charged with felony assault on Tuesday. A white man involved in an earlier brawl that day said he was injured by Harris, and authorities drew up an arrest warrant. But a lawyer for Harris said it wasn’t his client who committed the assault. Instead, he said, it was a group of white men. For weeks after being attacked, Harris found himself at the center of a social media firestorm. He’d been beaten bloody by a half-dozen white men at the “Unite the Right” rally-turned-riot in Charlottesville, where a group of white nationalists and Nazis clashed violently with counter-protesters. Video of Harris being pummeled with pipes and boards made the rounds in the media as online activists launched a virtual manhunt for his attackers. Two men would later be arrested and charged with malicious wounding, a felony. The last that many people saw of Harris, a 20-year-old African-American, was images of blood pouring from his face and scalp as he stumbled from the scene of the brutal beating. But after months of remaining relatively incognito, as his supporters continue to push for the arrest of the other men involved in his attack, Harris became one of the men charged with a crime. On Tuesday, a magistrate in Charlottesville issued a warrant for his arrest, accusing him of "unlawful wounding." Harris’ attorney, S. Lee Merritt, said the man who claimed to be injured by Harris was Harold Ray Crews, a North Carolina-based attorney, who is described by the Southern Poverty Law Center as a member of the League of the South, which the SPLC lists as a hate group. He said the evidence Crews presented was a video of a scuffle that included Harris and Crews, with Crews trying to spear Harris with a flagpole and Harris swinging back with a flashlight. Merritt said the video presented by Crews does not prove that Harris committed a felony assault. It barely proves that he struck Crews at all, he said. “It was a flimsy swing. It would not have justified the kind of charges brought in this case," Merritt said. He provided NBC News with another video clip shot the day of the riot that shows a group of white men pummeling Crews, one of them striking Crews in the head with a blunt object. The charge of unlawful wounding, a felony, requires great bodily injury, he added. Crews did not respond to NBC News' multiple requests for comment. Meanwhile, Merritt said he and Harris haven’t arranged a time for his surrender yet, but that they’re cooperating with Charlottesville police. Before the attack, Harris was working as a full-time teacher’s assistant in the city and preparing for the start of a new school year. But ever since, he’s been something of a recluse, his lawyer said. Merritt described how Harris tried to pick up where he left off in the classroom but became racked with fear and anxiety. Large, crowded public spaces made him feel sunken and paralyzed. The trauma was so debilitating that he had to move back home with his family more than two and a half hours away, the lawyer said. Since then he’s undergone physical therapy to help heal his physical wounds, but has yet to fully address the psychological wounds that he suffered that day.